Welcome to the land of tomorrow! No, you haven’t just stumbled out of a cryogenic chamber, à la Futurama. 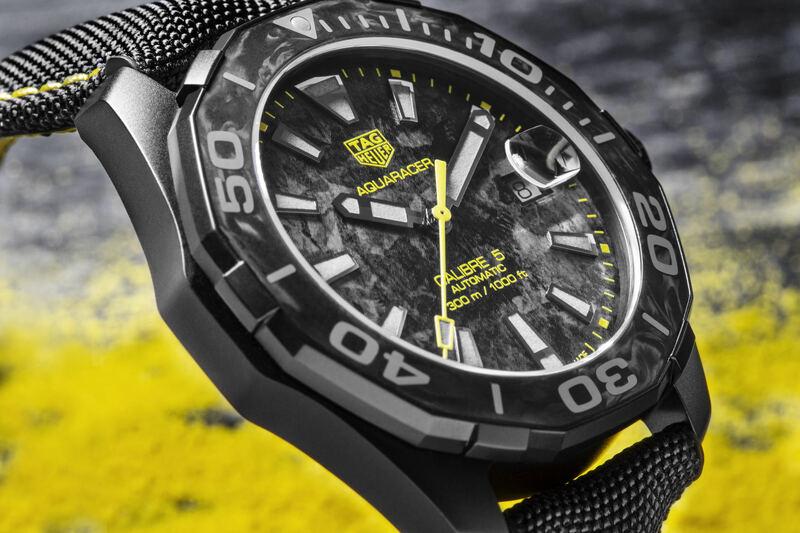 TAG Heuer have just unveiled the most modern version yet of their decisive dive watch, the Aquaracer 300M, sporting a brand-new carbon costume, and available in three different colourways. 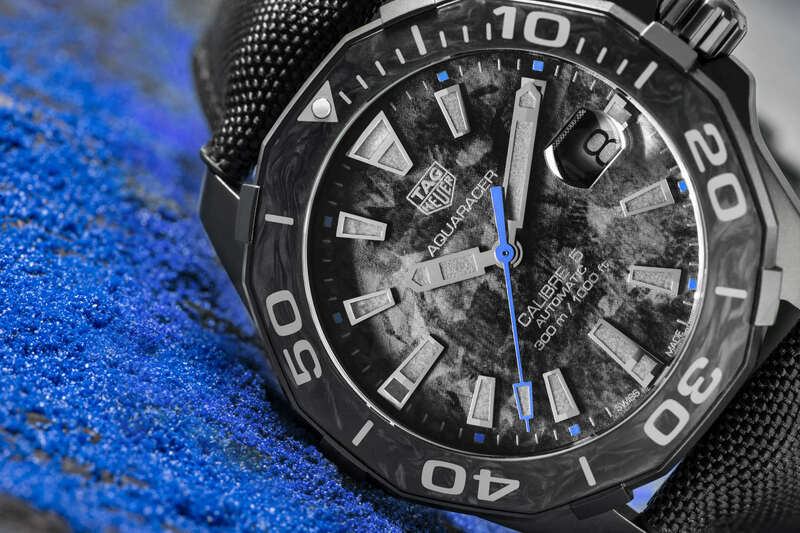 Starting today, each carbon-based model will be available exclusively through TAG Heuer boutiques and online around the globe. Blacked-out with a PVD coating, each version features a 41mm Grade 5 titanium case, and is then topped by a unidirectional rotating bezel that’s been crafted by a random injection of carbon fibres into a resin pressed at high temperatures. This produces a marbling black and grey effect that means no two Aquaracers are the same. As with previous versions, cases are rated to 300 metres of water resistance, and inside is where you’ll find a familiar automatic Calibre 5 movement. 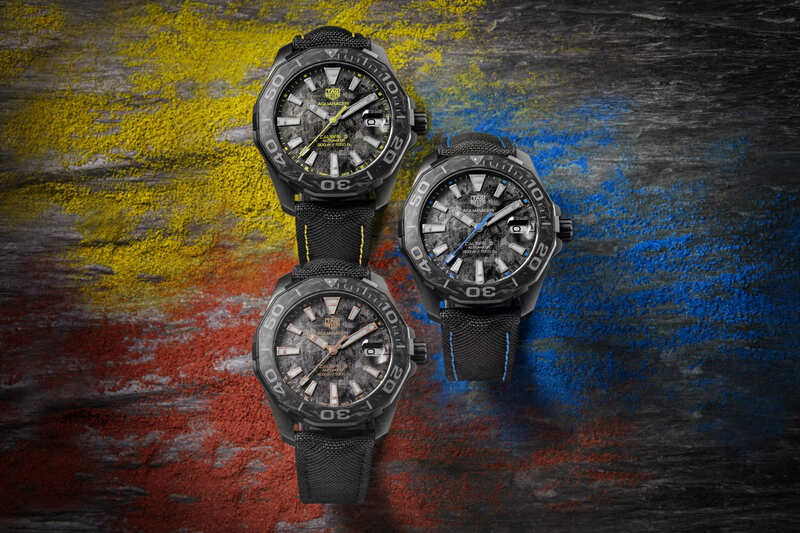 Separating the three models are highlights of blue, yellow, or rose gold, which can be seen on their black nylon straps, as well as on the minute markers, hands, polished logo, and text of their carbon-look dials. 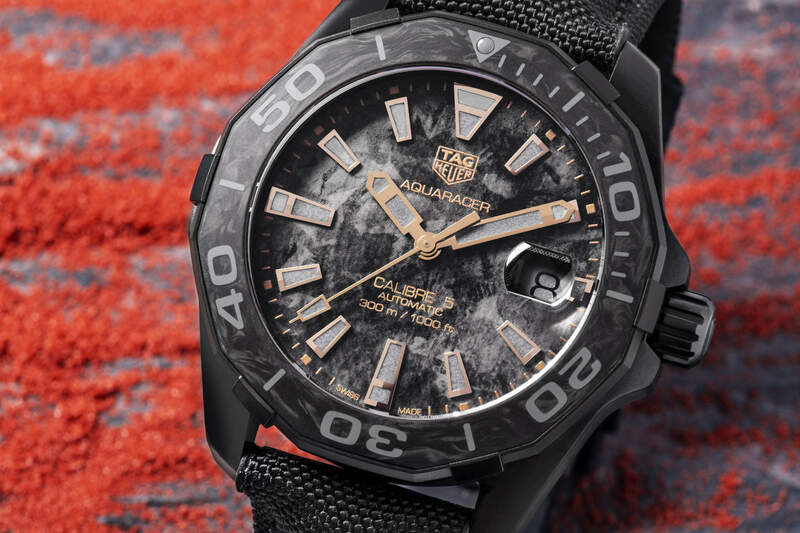 Similar in style to this year’s other carbon crowd-puller, the TAG Heuer Monaco Bamford – which also happens to be available in boutiques and online from today – these new Aquaracers sit side by side in what we expect will be an ever-growing Carbon Collection for TAG Heuer.